When I was younger, I remember watching my dad make cute baskets out of oranges. I was always impressed that my dad could make these. (because he wasn't usually very present in a kitchen). But, when it came to getting ready for a dinner party, my dad would get out his knife and cut away. He's also pretty handy with a saw, so perhaps it came naturally for him to carve out fruit. 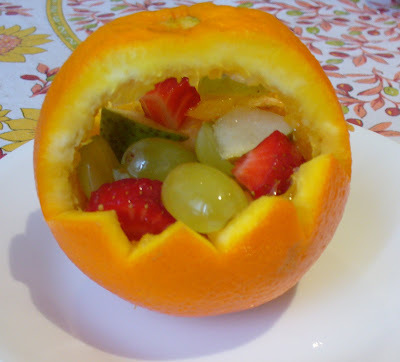 You can also do this with watermelon, cantaloupe, or any round type fruit. (although the orange peel is easier to cut through). I decided to try my hand at these for our Easter dinner. You could even add some green coconut on top to look like grass or grapes for the "eggs". I may consider wrapping a licorice "bow on the handle just to make it more enticing for my kids. Next either cut a straight line across the middle of a zigzag. Do not cut all the way around. Make sure you stop where you cut the handle. It should look like this: (but make your handle a bit skinnier than this one) Now proceed to cut around in the middle to get out the orange. You may need a spoon or a melon baller to help you get it all out. This will be juicy and potentially messy. Pour the juice into a bowl that you are going to mix your fruit salad in. Now scoop your fruit salad into your basket. You may want to arrange it so that a couple grapes are on top to resemble Easter eggs. I added some green coconut to this to look like grass, but I'm thinking it's a bit too much. What do you think? Don't miss a single recipe on Recipe Shoebox--sign up on the right for free email updates. Also, don't forget to "LIKE" Recipe Shoebox's new Facebook page! These are so cute! My kids would absolutely love these! I think it would be fun to make these baskets and then give them away to friends :) I will have to try this soon. Very soon. This is a great idea, I have never seen this suggestion before, I guess the orange peel is strong enough to support some weight in the basket! I agree with Bryan - making use of the thick citrus peel is a great way to give the basket some stability and balance - it's such a cute and adorable fruit basket idea.